*Also search Facebook for Four to the Floor Horsemanship, for more pictures and uses on different horses. Wet the horse’s coat thoroughly with warm water. Dilute at least one in four with water, and apply to coat. Rub into the coat to produce a lather, then massage deeply to cleanse skin, and then rinse with water thoroughly. What makes Pottie’s Shampoo different from other shampoos? 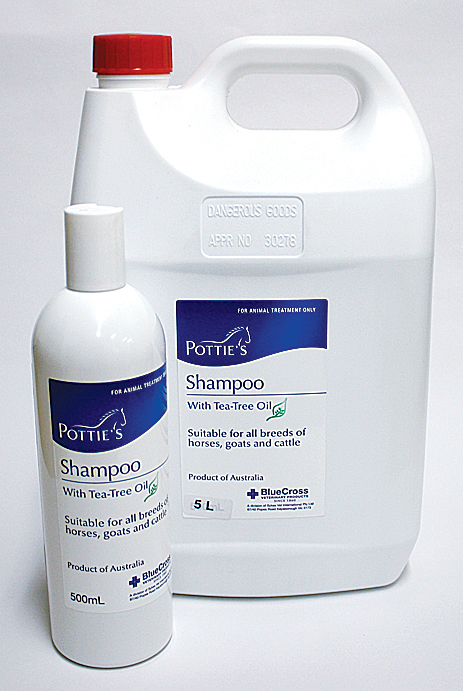 Unlike most other horse shampoos, Pottie’s Shampoo contains Melaleuca Oil (Tea Tree Oil) and is therefore fantastic for use on horses with sensitive skin, as it is known for its mildly medicating properties. The Tea Tree Oil also helps to prevent flies and mosquitoes, whilst leaving the hair smelling fresh and clean. It can be used on either light or dark horses and is perfect for horses who have dry skin flakes and/or a greasy coat. It lathers really well, making it a cost effective shampoo. Store below 30 Degrees (room temperature).